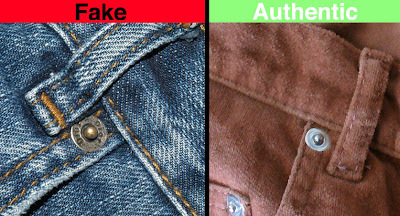 some dior jeans do have a logo engraved button but it is very rare. 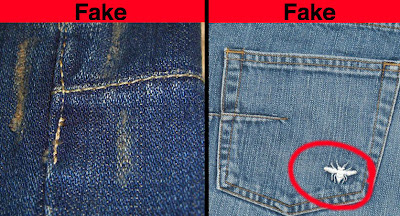 I have some trouser cut jeans from about three years ago that do and the top button is not a clasp but rather an angraved button but this is only on the top button and not on the buttons that make up the zipper/fly of the jeans. I have a pair of dior homme jeans with the engraved button at the top with the rest blank. At 1st I was not sure on the authenticity as I have a couple of other pairs (purchased from Dior in Milan) with the clasp. The quality seems good, both the labels; wash and the leather label seem to be authentic. I purchased them on ebay about a month a go. They were meant to have been from one of Hedi's last few collections. There was a tag attached that has unfortunately been thrown away, but I have a pic of it. Where do you want me to send pics and info to? Maybe you can tell me what you think? 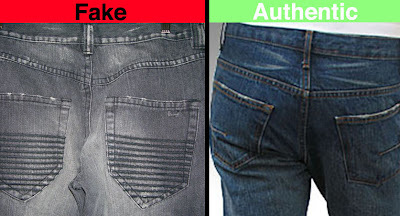 Sure, Upload your pictures of the jeans to the Fake Hunter Discussion Board on flickr.